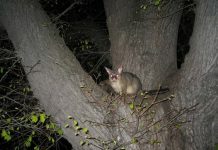 Brushtail possums (Trichosurus Vulpecula) are generally folivores. Like most other possums, they are nocturnal too. Possums do occasionally take on small mammals including rats. Common brushtail possums are thought to feed on numerous types of vegetation. They will eat Eucalyptus leaves as well as fruits, seeds, shoots, and flowers. Let’s find out what do brushtail possums eat in the wild. Brushtail possums are folivores which means they are specialized in eating leaves. Additionally, possums also consume small vertebrates, birds’ eggs, chicks, rats, and insects. The possum’s primary diet consists of shoots, flowers, fruits, buds, seeds, and flowers. They are known to consume as many as three to four different types of plants while they travel at night. This is quite uncommon in other marsupials including koalas or gliders. The brushtail possum has rounded teeth that allow it to chew fruits more efficiently. While they do enjoy feeding on Eucalyptus leaves, they just can’t rely on these leaves simply because eucalyptus leaves do not provide enough nutrients. As is evident from the (below) chart, possums derive 69% of its diet from just three species of woody plants. These are; southern rata, kamahi, and mahoe. Possums fancy feeding on ferns which make up 11% of their diet. Many of these ferns are ground ferns although they also eat epiphytic Polypodiaceae and tree ferns. About 0.4% of the brushtail possum’s diet comprises arachnids cuticles, pteridophyte rhizomes, sporangia, bark, and flower petals. Possums inhabiting at low altitudes are most likely to feed on Asplenium bulbiferum, wineberry, grasses, and clover spp. Additionally they will also eat kamahi and mahoe. Neopanax and cedar are largely consumed by those that live at high altitudes. 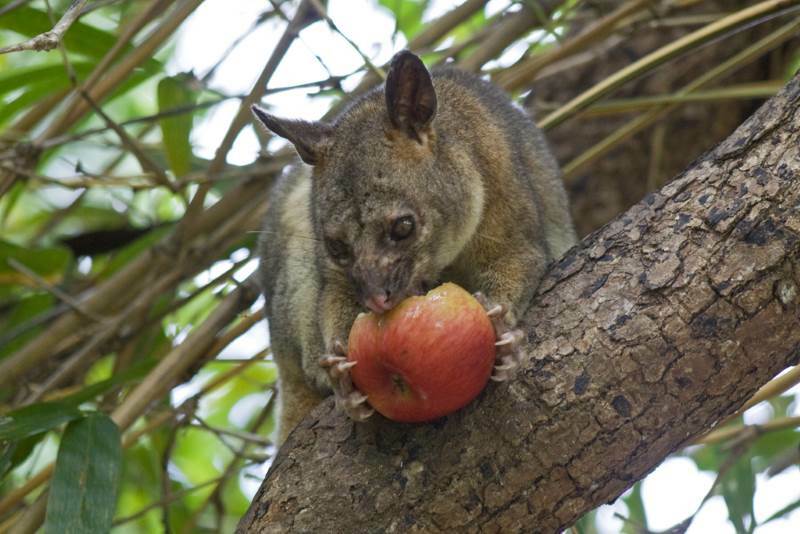 Northern Brushtail Possum is feeding on an apple. Do Males and Females Eat the Same Type of Food? 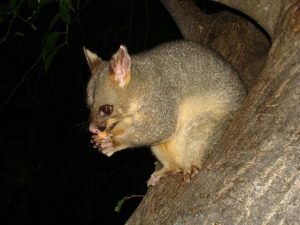 As far as their primary food is concerned which is foliage of woody species, both male and female possums eat the same food. When it comes to ferns, females are thought to consume greater proportion in comparison to the males. During summer, females tend to rely on woody species more than the males. But pasture species and forest herbs are eaten by males in larger proportion than those by females. Both males and females feed on fruits in pretty much the same proportion. Compared to males, females also eat mahoe and southern rata in greater quantity. 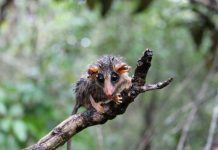 What Plants Do Brushtail Possums Eat? Harris PM, Dellow DW, Broadhurst RB, (1985) “Protein and energy requirement and deposition in the growing brushtail possum and rex rabbit”. Australian Journal of Zoology 33:425-36. Harvie, A. E. 1973. Diet of the opossum (Trichosurus vulpecula Kerr) on farmland northeast of Waverley, New Zealand. Proceedings of the New Zealand Ecological Society 20: 48-52. Freeland, W. J.; Winter, J. W. 1975. Evolutionary consequences of eating: Trichosurus Vulpecula (Marsupialia) and the genus Eucalyptus. Journal of Chemical Ecology 1: 439-55. Green, W. Q.; Coleman, J. D. 1984. 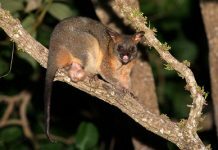 Response of a brush-tailed possum population to intensive trapping. New Zealand Journal of Zoology 11: 319-28.